Sedenka: Bulgarian cultural workshop. 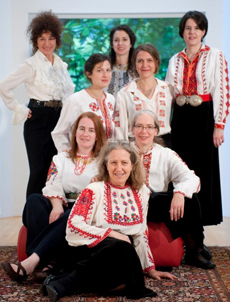 Bring your knitting to a Bulgarian village “working bee.” Welcome spring by listening to vocal group Orfeia, learning traditional songs and dances, and immersing yourself in Bulgarian culture. March 5, 2011. 2-4 PM. Church of the Holy City, 1611 16th St NW. All welcome; suggested donation $20. (802) 345-6460. Tatiana Sarbinska is an internationally-acclaimed performer, composer, and director who has dedicated herself to sharing her extraordinary talent and her deep love and encyclopedic knowledge of Bulgarian traditional music and culture both in her native Bulgaria and throughout the United States. Founded in 2006 by the legendary Bulgarian singer Tatiana Sarbinska, Orfeia celebrates the rich and varied folk music traditions of the Bulgaria and the Balkans. From the motifs of village life to the sacred and spiritual, from the medieval to modern adaptations, Orfeia presents an authentic Balkan sound in the context of its cultural and folkloric traditions.